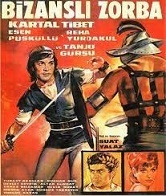 Turkish comic book hero Karaoglan (Kartal Tibet) battles the evil emperor and his gladiators in Constantinople. Also stars Esen P�sk�ll� and Reha Yurdakul. (In Turkish language, with English subtitles).